In the first of a lengthy three part series, producers Chris Octane and Liam O’Mullane invite you to join them in the studio, where you can observe their methods and advanced techniques for creating a serious Drum and Bass groove. Currently producing as part of newly formed outfit ‘colo[r]’, Chris and Liam bring together a veritable mountain of experience in electronic music production, DJing and sound design. In the first instalment, Octane and Liam create their signature drum sounds by combining synthesised and acoustic elements. Next, they create a pattern and apply processing and effects to give it the punch and power to carry the track. Their attention to detail is evident when it comes to designing the bass: expertly manipulating synthesisers, filters, and other effects, including altering parameters on the fly using an iPad – which interfaces with Live using Max for Live objects. Following this is a lesson in creating edgy, dynamic percussion using sampling techniques and expansive manipulation. To conclude, colo[r] fine tune the various elements to wrap up the foundations of their new track. For more information, check out the course trailer below. Chris Octane and Liam O’Mullane introduce you to their plan for the session with a brief discussion about where to start the track. colo[r] start by working on the synthesised elements of the main drums. Skilfully manipulating various oscillators, they create powerful artificial snare and kick drums sounds. These electronic sounds will be combined with acoustically recorded duplicates in the following section, to create realistic and powerful beats. In the second drums section, Chris and Liam map an acoustic kit to Push. They then combine this with the synth-drums, applying various processing including side-chain compression. Next, they set up a stereo image for the drums, including a novel technique that makes use of the HAAS effect. The combined processed synth and acoustic drums create a beat with tremendous depth. colo[r] begin working on the bass by creating the super-low-frequency elements. Various processing is applied, including notch filters and an envelope follower working in tandem with EQ. In this module, Chris and Liam begin work on the bass part. Using Analog, they synthesise the twisted bass sound that the genre is so well known for. They then manipulate the various controls to create the sound they want, before applying various effects including grain delay. Continuing with the low end, Chris and Liam demonstrate how they use an iPad, mapped to an XY device in Ableton, to control multiple parameters from different plugins simultaneously. This enables automation to be written in a more performance-like manner, which is an integral part of their process for creating bass-lines. In this section, you will see how colo:r use the arrangement view to perform slip editing, an extremely useful sampling-based technique. colo[r] return to the bass sound, to further refine it. After multiple automation passes and processing using parametric EQ and multiband compression, they show you how to freeze the sound and map it to the Push, before further manipulation of the sound using macro controls. 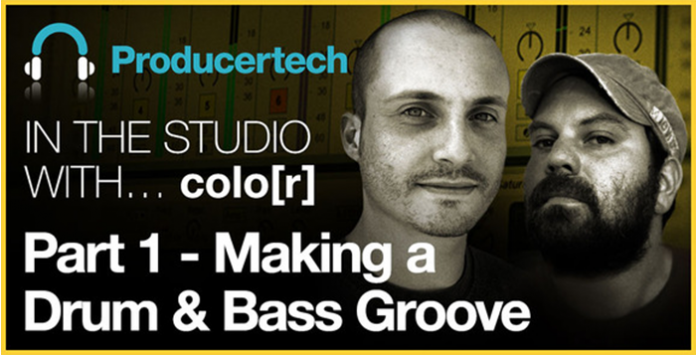 In this section, Liam and Chris use the step sequencer to create a bass-line. They make use of the touch sensitive fader on Push for automation passes and really begin to focus in on the DnB groove. This section is all about refinement. Additional parts are recorded, filters and other processing are applied and automation is used on the drums. In the final section from this instalment, colo[r] spice up the track by adding various percussion elements, including parts from Octane’s pack, which they set up to be played using Push. A variety of effects are used to add funky variations to the percussion, including auto-pan, automated EQ and auto-filters. This module then concludes with a summary by Chris and Liam.